1. Aluminum fin-shape heat sink and active air exchanging cooling system. 2. Modular structure of LED industrial Light could be applied for power variation by module increase and decrease. 3. Beam angle of modular could be adjustable to fulfill various lighting requirements. 4. Unique design removable power supply and light source. 5. IP66 ideal for outdoor use. Our individual package maximize protecting the flood lights from transfer damage in transit. 1. Label on backside of each flood light and your required label is available. 2. One piece led flood Light per carton. 3. 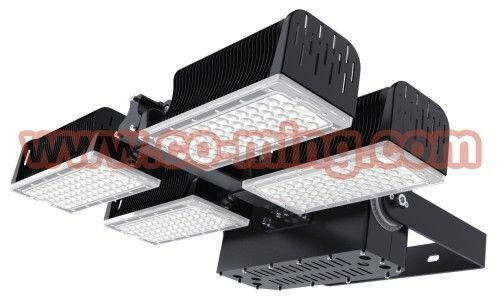 This is our regular packing of the led flood light, if you need, we can also custom your own color packing and put your logo on it. 1. Any inquiries, will be replied in 24 hrs. 3. All after sale problems will be deal with in 24hrs. 5. Distributorship is available for your unique design and some our current models. 6. We will keep secret for customer sale area,design ideas and all other private information. 7. Offer 3-5 years warranty. 8. Lighting design & solution for free --- Provide IES file, Dialux lighting design.